A couple of months ago, the Museum received a call from the owners of a house in the historic Anacostia neighborhood. 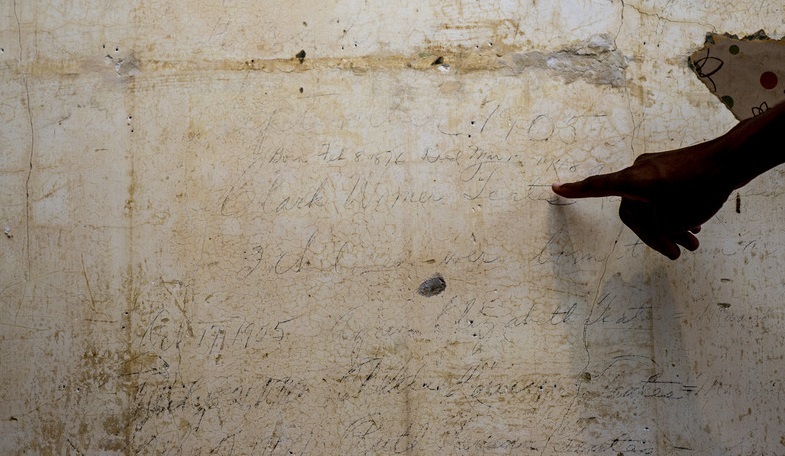 The Reeves family was beginning renovations when they discovered writing on a bedroom wall. In faded letters, they could make out the words “Clark Womer Teates,” among a series of other names. Looking in the DC Historical Building Permits Database, they discovered Teates was the first owner of the house when it was built in 1905. Intrigued by their discovery, the Museum’s staff photographer and I headed over to see for ourselves. The Museum strives to document and preserve local history, and our photography collection targets sites, people, and events that shine a light on our communities. This sounded like an opportunity to learn about the residents, past and present, who have made historic Anacostia home. We soon discovered that the writing on the wall was a family tree of the Teates nuclear family. The patriarch, Clark Teates, appears at the top, next to his wife, Rosann. Below them are their three daughters in order of birth, Agnes, Ruth, and Alice. Both Clark and Rosaan names are followed by birth and death dates. Barely legible to the right are the names of the husbands and children of the Teates daughters. Returning to the Museum, we searched Census records and Washington, DC newspapers. Born in Pennsylvania in 1876, Clark Womer Teates came to Washington, DC during the 1890s by way of Fauquier County, VA, where he received accreditation to serve as an attendant in a hospital. By 1897, Clark found employment at the Government Hospital for the Insane (St. Elizabeth’s Hospital) in the southeast quadrant of Washington, DC. The 1900 Census records him as living at the hospital. 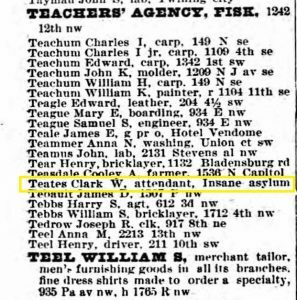 Clark Teates listed in the 1897 Washington, DC City Directory. In 1901, Clark married Rosann Smith. Four years later, in 1905, the couple welcomed their first daughter, Agnes, the same year they moved into their new home in Anacostia. Daughters Ruth and Alice were born soon after. By 1910, Clark had changed employment to the United States Government Printing Office (The United States Government Publishing Office), where he worked as a caster operator. Rosann also worked for the Federal Government in the Internal Revenue Service as late as 1940. 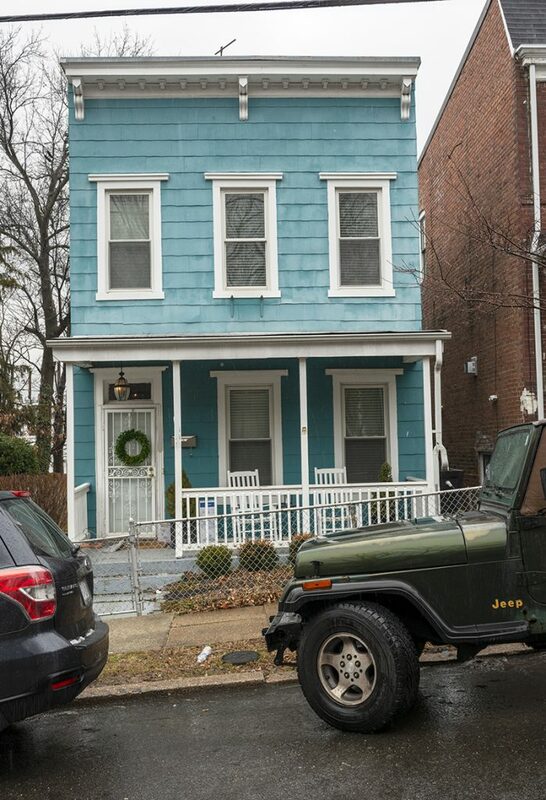 Clark and Rosann continued to live in their Anacostia house for the rest of their lives, marking a half century of Teates ownership and occupation. Sometime after Clark’s death in 1948, someone decided to write the family tree on the wall. It is possible that it was one of the Teates daughters, before the house left the family for good after Rosann’s death in 1958. They left behind a small piece of personal history for future occupants of the house to discover, decades later. When the Reeves bought their home in historic Anacostia, they knew that they were settling in a community steeped in history. Little did they know, their house has a rich history of its own recorded on the bedroom wall, with the names of the first family to make memories there. A photograph of the wall is now part of the Museum’s Community Documentation Photography collection, for others to discover and enjoy, while the house itself continues to be a cherished home for an Anacostia family over a century later, a space where the Reeves will make family memories for years to come. If you have a story or history that you would like to share, please contact us.